BLM works with other agencies and organizations in managing the Cascade-Siskiyou National Monument. These links connect to some of our partners. 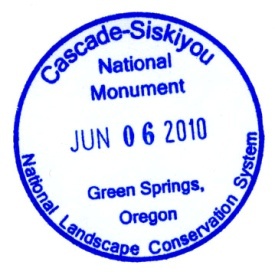 The Friends of Cascade-Siskiyou National Monument was established by local residents in 2000. FCSNM's primary goal is to partner with the Bureau of Land Management as it carries out the mandates of the presidential proclamation. The mission of the Friends of the Cascade-Siskiyou National Monument is to protect, restore, and conserve the resources and values for which the Monument was established. The Friends sponsor "Hike and Learn" opportunities which bring local scientists and agency specialists together with interested learners, and participate in Rogue Valley Earth Day each April and National Public Lands Day each September. The Friends also partner with BLM and Southern Oregon University to support environmental education school programs on the monument each fall. CSNM Visitor Center located at 11470 Highway 66. The Friends of Cascade-Siskiyou National Monument work collaboratively with the BLM to manage the CSNM Information Center located at 11470 Highway 66, next to Green Springs Inn and Restaurant. The unstaffed information center provides brochures, maps, planning documents, educational displays, and recreational information about the monument. The FCSNM helps to create and maintain the displays, exhibits, and other media designed to orient and inform visitors to the monument.